Did you forget Samuel Johnson’s birthday? Samuel Johnson was both a great writer and a great character; according to the Oxford Dictionary of National Biography “..arguably the most distinguished man of letters in English history“. With his dictionary doing so much to define the English language you would expect the 300th anniversary of his birth (last Friday) to have made a bit of an impact online. Unfortunately, despite some great programmes on both BBC Radio 3 and BBC Radio 4, the public failed to be overly moved. In fact according to Google Trends, whilst September has caused a slight blip, interest in “Samuel Johnson” has been falling over the years. 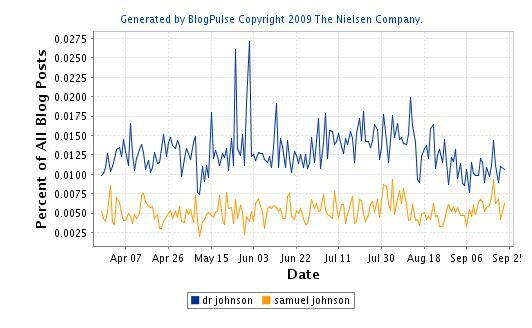 The blogosphere shows no more interest than usual, and far less than the announcing of the Samuel Johnson prize. Obviously some historical figures stand the test of time better than others. 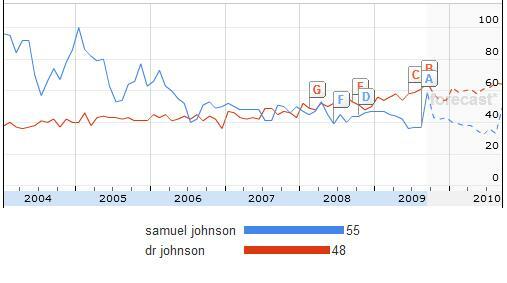 The graph below shows the leap in interest for the mere 200th anniversary of Charles Darwin’s birth (the red line at the bottom provides a comparison with Samuel Johnson). The two men have very different legacies, but nonetheless I can’t help feeling that Samuel Johnson has been unfairly overlooked online. Whilst everyone seems to want to get on the Twitter train of the real-time web these days, I think I want to get off and take my time to blog a bit more. Since I first went to the Birmingham Social Media Cafe back in January I have thrown myself into Twitter head first: following 124 people, posting 1,403 updates, and even going along to the BrumTwestival! However there is a downside: I blog less. Those who read my blog may not think of my blogging less as a downside, but blog posts are as much for me as my readers. They are an opportunity for me to put down my thoughts on the web in a fairly coherent manner. The real-time web means that I am more focused on what is happening right now, rather than reflecting on what has happened. The real-time web has it’s place for breaking news and customer engagement, but for some of us a slower blogosphere (or even traditional publishing) is a more suitable place to explore our thoughts. Let’s hope the world doesn’t go too far exchanging quality for speed. Each month Wikio publishes a list of the most influential technology blogs in the UK blogosphere. As my own blog is likely to be a contender for the least influential tech blog in the UK I decided to take time to visit each of the top 30 most influential technology blogs in the UK and draw together a few rules for becoming a top tech blogger. Anything you like. Whilst there are obvious benefits from the “it does exactly what it says on the tin” approach to blog naming (e.g., Phones Review), qwghlm.co.uk’s success clearly shows that your blog name doesn’t even need to be pronounceable to be popular. If you can’t think of anything, don’t want to pigeon-hole your blog in the longterm, or just want to see your name up in lights, you can always join the 17% of the top 30 who have chosen to name their blogs after themselves. Anything goes, from long wordy pieces (e.g., qwghlm.co.uk) to shorter bite-sized pieces (e.g., Gadgettastic). With billions of internet users out there, there will be millions who prefer each of the different styles, so feel free to blog in the format most appropriate to you. Should a blog stay on topic? It makes no difference. Whilst I often worry that my own eclectic mix of blog posts will put people off subscribing to my blog, it seems as though my lack of subscribers is more to do with the quality of the posts than what I am posting about. The most influential technology bloggers have few qualms about posting about anything that crosses their minds: football, politics, music (or is that music as an excuse to post about scantily dressed women?). Unsurprisingly collaborative bloggers are more likely to stay on topic than personal blogs. How regularly should you blog? Several times a day, extremely rarely, or somewhere in-between. At one end of the scale you have the collaborative blogs which are more akin to traditional media with numerous writers publishing many stories each day (e.g., TechCrunch UK), whilst other blogs average only one or two posts a month (e.g., Simon Willson). Xlab shows that you can even stop blogging and continue to be listed as one of the top UK bloggers. The spirit of the blog as an alternative to big media is alive and well with many of the wikio’s most influential bloggers being individuals, however there is no harm in being part of the traditional media scene: dot.life (The BBC’s technology blog); The Red Ferret Journal (columnist and feature writer for the Sunday Times); The Guardian Technology Blog (surely no explanation required). 1. Call your blog something. 2. Post in some format. 5. Buddying-up with a national media organisation won’t do you any harm. Some would say that an examination of the most influential tech blogs shows that there is no hard and fast rules for becoming a top tech blogger, just write about what you want in your own style, and if people visit they visit. However, I think by following my consise summary readers will have no excuses for not becoming one of the most influential tech bloggers by this time next year…all I need to do is buddy-up with a national media organisation for the complete set. At some point, lost in the mists of time and place that is the web, I signed up to Twingly (yet another blog search engine). I just returned to the site for the first time since signing up, as they sent me an email highlighting their new ‘blogrank’ and ‘top 100′. Whilst their blogrank isn’t worth mentioning (primarily because mine is a pathetic ‘you get 1 for turning up’), it is always interesting to see lists of the ‘top bloggers’, especially when there are such differences between the lists. Does Bibliometrics need a Blogger? [Although two blogs are 'related' to Scientometrics]. If blogs are a useful way for sharing the latest news and information in a particular discipline, as well as the promotion of a discipline, then surely bibliometrics would benefit from the odd bibliometrician blogging occasionally [...for the sake of inter-disciplinary relations I will eschew the joke about bibliometricians being odd]. Admittedly the webometric blogs are not the best example of academic blogging, but it is a burgeoning online community of sorts. "One third of bloggers have received free products"
I’m beginning to take the general attitude to my blog personally. Whilst I kept calm when I read that the mean income from a blog with advertising is $6,000 p.a., to find that a third of bloggers have received free products through their blogs is a bit hurtful. According to Technorati the top categories of free products that everyone else seems to be receiving are: DVDs, music, books and video; Computers; Electronics. Do I not read? Listen to music? Watch DVDs? Spend a small fortune on electronics I can’t afford? Technorati are releasing their annual state of the blogosphere during the course of this week. Giving a round up of who is blogging, how often they are blogging, and what they are blogging about. It shows that whilst I epitomise the average blogger, that isn’t enough in the scale-free network of the web. The average blogger is male, 18-34, ‘college’ graduate, and have a household income over $75,000. They have been blogging over two years and half have a second blog. However, whilst I blog regularly and find myself firmly in the top half of active blogs (1.5 million blogs posted in the last 7 days, Technorati ranks me 601,571), I earn nowhere near the mean annual revenue for those with advertising: $6,000. My current Google AdSense earnings: $16.61. The reason for this discrepancy is the power-law distribution of traffic and earnings; most of the bloggers are hanging around in that long tail. If Technorati has decided to show the mode average of blogs with advertising, it would probably be have been nearer to my measly $16.61 dollars. Did everyone leave the blogosphere without telling me? When you have a number of things on the go at once, your blog and your RSS feed-reader are inevitably the first things to suffer. You have no time for writing any posts of substance, whilst you are all too aware of the potential for whiling away the day if you dive too deep into the blogosphere, as such you are wary of starting either. However, after finally finishing a book review that has been hanging over my head for weeks at 2.30am, I approach my feeds with pleasure this morning. Not only would I have the time to give more than a passing glance to the stories that piqued my interest, but I would have time to write about them if I so wished. Unfortunately it seems that the blogosphere has gone on holiday. Despite not having the opportunity to check my feeds since Friday morning (a weekend to the mere mortal is a lifetime to a blogger), I found that it was filled with a rather measly 170 posts, barely half a glance’s worth. This lack of new information was then couple with my so-called open desktop (as open as the average bank vault) refusing to allow me to install Google’s Lively Virtual World, something I have wanted to have a look at for a couple of weeks. So all in all it has been a rather disappointing start to the week. Could the blogosphere please let me know in future when it decides to go on holiday. When I started ‘Webometric Thoughts’, almost ten months ago, there was a lot of talk about the death of the blogosphere in favour of the newer (and shinier) social networks and microblogging. Hitwise figures, however, show that far from dead traffic to blogs and personal websites is at an all time high (in the UK at least): Blogs and personal websites account for 1.19% of all UK traffic. The new high is particularly impressive as it shows traffic to blogs and personal web sites rebounding from a dramatic fall during the first three quarters of 2007, from just over 0.8% of the traffic in January down to just over 0.4% of the traffic in August. It was August that I started to blog, and the blogosphere was unsurprisingly discussing its own demise. Whilst the blogosphere has weathered the storm of social networks, and is in a stronger position to weather the possible coming storm of microblogging (if Twitter ever gets its act together), the statistics give no insights into why there has been an increase. Have blogs and personal web sites responded to falling traffic by improving the quality of their sites? Is it a greater emphasis on blogs by the big players (e.g., Windows Live Spaces & MySpace Blog)? Or is it all the result of small changes in the Google algorithm promoting the heavily interlinked blogs? Whatever the reason, blogs and web sites will need to improve if the recent traffic increases are to continue, probably including aspects of social networks and microblogging, as well as technologies not yet thought of. Hopefully, however, blogs will continue to be primarily independent affairs that are not too reliant on the whims of the big organisations.